Floodwater levels in upstream Mekong River are rising rapidly and may exceed the third danger mark sooner than expected, sending authorities in the entire area to work on a war footing to save lives and property. Le Van Nung, Deputy Director of the People’s Committee in the Mekong delta province of An Giang, said that the dyke system protecting more than 130,000 hectares of rice growing area has already been well fortified and reinforced. The People’s Committee of the province has instructed authorities at all levels to stay alert round-the-clock and to pump water out to protect the autumn-winter rice crops, especially in upstream areas along the Hau River and in the Long Xuyen Quadrangle. Local governments are also organizing child-care groups as well as volunteers to take student to and fro from schools. Rescue teams are on alert to relocate citizens from landslide prone zones and flooded areas to safer camps. According to Pham Van Le, Head of the An Giang Flood and Storm Prevention, Search and Rescue Steering Committee, after the Tha La and Tra Su reservoirs in An Giang Province released their floodwaters on September 15, water levels in the Long Xuyen Quadrangle, especially in Chau Phu District, have risen much higher. Many parts of the dyke system in Dong Thap province, which lies at the heart of the Mekong Delta, are lower than required and in threat of being breached, endangering around 14,736 hectares of autumn-winter rice crops in Tan Hong, Hong Ngu, Cao Lanh, Thanh Binh, Tam Nong and Lap Vo Districts. Nguyen Chi Lang, Head of the Agriculture and Rural Development Office in Tan Hong District, said that water levels in Sa Rai Town measured at 4.56m, 1.54m higher than the maximum level last year, which could breach the embankment that is protecting thousands of hectares of rice fields. 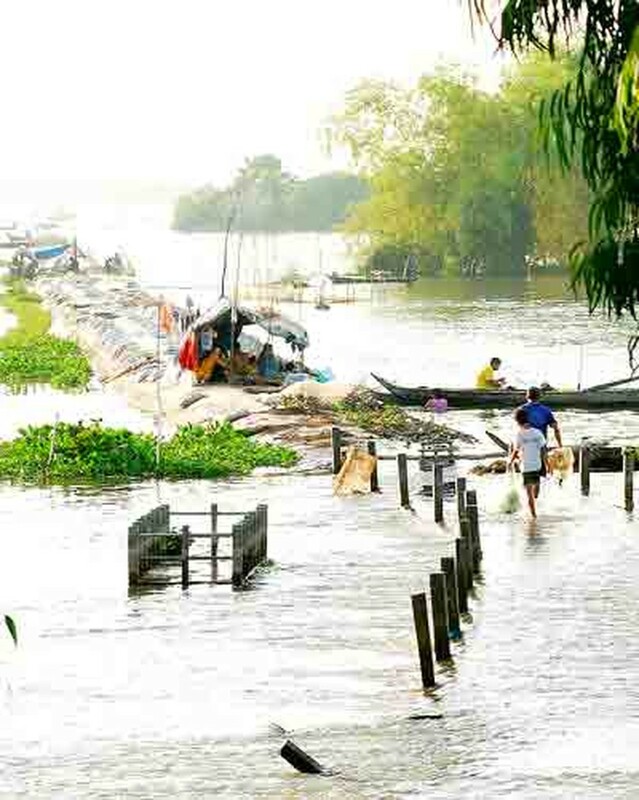 The most vulnerable spot in the district at the moment is the 400 hectare weak levee in Chien Thang Hamlet in Tan Thanh A Commune, where floodwater levels were almost touching the same height as the dyke. Similar situation prevails around the 2,250 hectare embankment in Tan Phuoc, Thong Binh and Tan Ho Co Communes. Adding to the already critical situation is the rapidly rising water level from upstream areas at an average 2-3cm per day and the high tide that is threatening more than 90 sensitive spots in Hong Ngu and Tan Hong Districts. By now, many streets lie submerged with major roads in Phu Trung Hamlet in Phu Thuan B Commune in Hong Ngu District inundated at the moment despite reinforcement measures just a few months back. Roads in Tan Hong District are also slowly eroding. Six schools have shut down in Dong Thap due to rising flood waters. Binh Thanh Elementary School in Binh Thanh Commune has allow pupils from grade 1-3 to stay at home, since the 2km road leading to the school is now totally submerged. Four other kindergartens are also facing a similar situation. As reported by the National Hydro-Meteorological Forecasting centre, consistent heavy downpours in the last few days in Central Vietnam have raised floodwater levels in rivers in the Northern Provinces of Thanh Hoa, Nghe An, causing havoc to property and people. Though the situation has slightly improved since the afternoon of September 22, water levels at the moment are still quite high (just below the second danger mark). Meanwhile, flood levels in rivers in the Central provinces from Ha Tinh to Khanh Hoa, including the Highland areas, have risen rapidly to just below the first danger mark and showing no signs of abating. It is forecast that water levels in rivers from Quang Binh Province to Thua Thien - Hue Province will reach the second danger mark level any time today. Besides Nghe An and Thanh Hoa Provinces, other central provinces from Ha Tinh to Khanh Hoa are also facing a precarious situation rising from high waves being caused by the oncoming tropical low pressure zone. 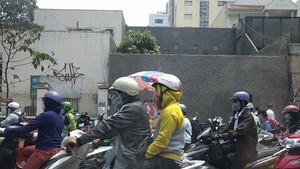 The local government is implementing various measures to cope with the situation since September 22. In the central city of Da Nang, the Flood and Storm Prevention, Search and Rescue Steering Committee has instructed all districts to organize rescue teams, to be available round-the-clock, to aid in relocating the elderly and children to safe residential camps. The city will also spend VND10 billion (approx. US$480,770) on food and water for citizens affected by the floods. Many major routes in the Central City of Hue were submerged under water yesterday. Some parts of National Highway No.1A were nearly half a meter deep under water. According to the Flood and Storm Prevention, Search and Rescue Steering Committee in Thua Thien - Hue Province, torrential rains are expected in the next few days, causing flash flooding and landslides enroute to A Luoi District. Ha Tinh Province has experienced pouring rain the past few days with precipitation of 182.9 – 365mm, causing more flooding of the summer-autumn rice crops. The entire district has a total of 40,000ha under rice cultivation ready to be harvested, of which 15,000ha has already been harvested. 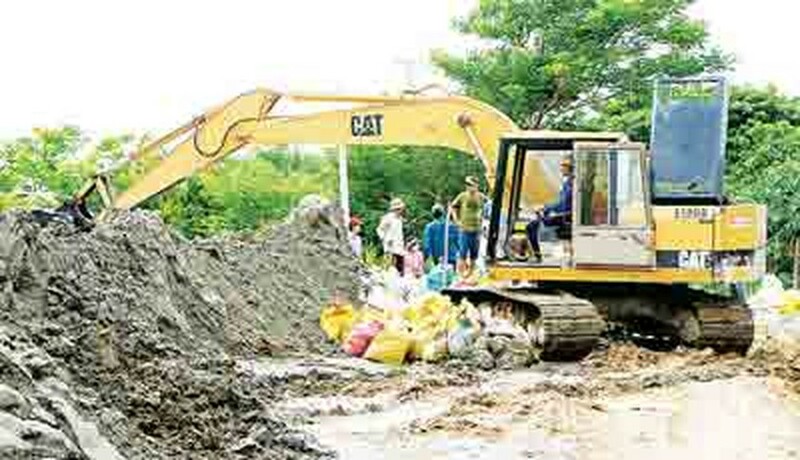 The People’s Committee and the Flood and Storm Prevention, Search and Rescue Steering Committee of Ha Tinh Province are asking related organizations to collect 519 cubic meters of freestones, 45 cubic meters of sand, 81 cubic meters of gravel stones, 32 steel grilles and 22,000 sacks to prevent a possible breach along the Ke Go Lake.